Balboa topside control panels and overlay graphics sticker for hot tubs. 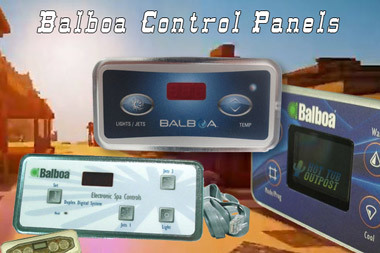 We offer many brands of replacement spa control panels by Balboa (see them below) and also Gecko, Hydro Quip, Brett Aqualine, Sundance, Tecmark and other spa component manufacturers. Get fast shipping on hot tub controls and control panels online at Hot Tub Outpost.